A USGS map showing the epicenter of a 6.4-magnitude earthquake that hit the Gulf of California on October 19, 2013. A 6.4-magnitude earthquake hit the Gulf of California Saturday morning, according to the U.S. Geological Survey (USGS). 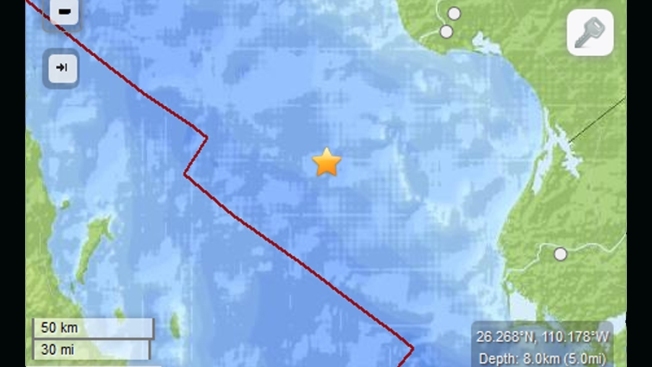 A preliminary report from the USGS says the quake happened at 10:55 a.m. in the Sea of Cortez between the western Mexican states of Sonora and Baja California Sur, about 47 miles southwest of Etchoropo, Mexico. Other cities in Mexico close to the quake’s epicenter include: Huatabampo, about 51 miles southwest; Villa Juarez, 62 miles away; and Ahome, approximately 66 miles away. The USGS says Phoenix, Ariz., is located approximately 507 miles from the epicenter. At this time, there is no widespread threat of a tsunami. No damages or injuries have been reported. According to the USGS, Mexico – which is located atop three of the large tectonic plates – is one of the world’s most seismically active regions. The area west of the Gulf of California, including Mexico’s Baja California Peninsula also sees its share of earthquake activity due to the Pacific and North American Plates grinding past one another, creating strike-slip faulting, the southern extension of California's San Andreas Fault, according to the USGS.